During our short visit to Bob’s hometown we drove the streets of his old neighborhood and shared memories. As we headed down Henry Street we point out Aunt Helen’s house, where the funeral home was a decade ago, churches family members attended. And, there’s Duke’s Bakery in the same location since 1951. We reminisce about how Grandma Mary used to always bring a couple of gooey butter cakes when she came for a visit. One would be consumed immediately and one frozen for a future indulgence. No where in Denver could we find a coffee cake quite like Duke’s. 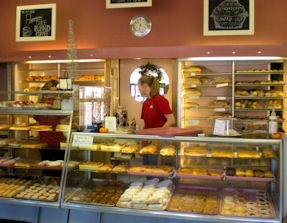 Deciding we could share one with Aunt Eleanor and family we doubled back to the bakery. The cases were filled with sweet treats including a couple of gooey butter cakes. My selection was easy; Judy chose large iced sugar cookies for each of us. With the first cookie bite we knew these were going to have to be dunkers. We’d assumed the pumpkin shapes were in honor of Thanksgiving but now think they might have been left from Halloween. When I cut into the cake a few hours later I immediately felt a stab of disappointment. The cake was dry and obviously several days, if not a week, OLD. Shame on Duke’s! I admit this is a personal rant; but, here’s my beef. Many communities that depend solely or in large portion on tourism can’t get their act together to present a comprehensive website for activities, dining, events and lodging information. Each special interest presents a small slice of t he picture. The potential visitor either has to be a world-class sleuth or already be familiar with the area to find all the meaningful information. I suspect in many cases the visitor gives up – either missing important parts of a visit or skipping the destination entirely because that small slice isn’t the right match. What set me off? My pending weekend in Crested Butte, Colorado. We have family living in “The Butte” and have visited dozens and dozen of times in all seasons. Well, maybe not the spring mud season. I’m a travel writer, I’m on PR email lists, I know the area and I’m frustrated. Can you imagine how the first time visitor from Oklahoma might feel? 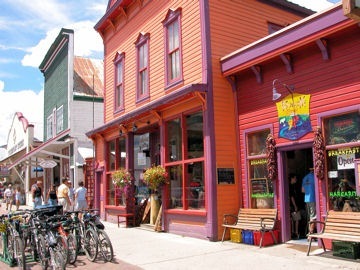 Google “Visit Crested Butte”, among the top choices will be www.visitcrestedbutte.com – a commercial site, www.gunnisoncrestedbutte.com – from the Gunnison – Crested Butte Tourism Association, and www.skicb.com – the site of Crested Butte Mountain Resort. Each site is totally self-serving. In an area of this size the likelihood of a visitor coming to CB and confining their lodging, dining and recreation to one provider is slim to none. Remember folks – Club Med failed here. Going to Crested Butte and want to know what’s scheduled? Good luck! It’s actually the biggest weekend of the summer but you have to dig deep for a even a semi-complete picture. 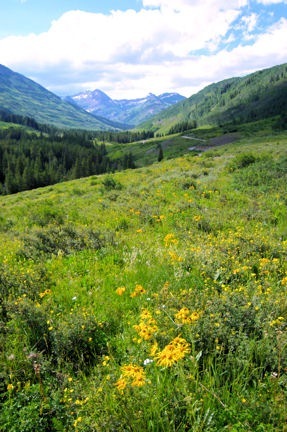 The Community Calendar at www.visitcrestedbutte.com lists Active Isolated Stretching Class on Friday, July 30th. That’s it! Their last Mountain Bike Report update was July 5th; and, this is truly a mountain biking haven. Does this information make anyone believe anything else on the site is relevant or timely? 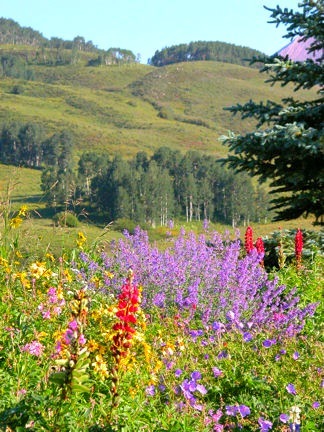 Over at www.gunnisoncrestedbutte.com the Crested Butte Art Festival is listed as a Featured Event. Clicking the name provides basic details and a link to the event website. Not bad. However, clicking on the 2010 Event Calendar takes me to a cumbersome listing of events with no links. The list is organized by the date of the first event; for example the Crested Butte Music Festival is listed under July 3 – Aug. 5 – Various locations. That’s all the information provided. They’ve put the money into lovely pictures and cute animation on this website but they only promote members. The Events Calendar at www.skicb.com notes the Arts Festival and Crested Butte Open Gala Dinner and Golf Tournament on Sunday at The Club at Crested Butte – a resort owned property. Because I had a head’s up from a local I know there’s a Mountain Man Rendezvous up Washington Gulch. By checking the Crested Butte Music Festival website I know when and where the free and ticketed events are this weekend. From the local paper, chamber of commerce, town and county web pages additional bits and pieces of information can be obtained. Why not combine resources and offer a comprehensive site that visitors will truly find helpful. Quit being small town provincial and work together. Our weekend will include lodging at CBMR, music, the arts festival, mountain man rendezvous, outdoor recreation, shopping and dining. We’ll have a wonderful time in spite of the tourism agencies.